Sometimes it's fun to make blocks just to get in some sewing, but then what to do with those blocks? Like those from last week. 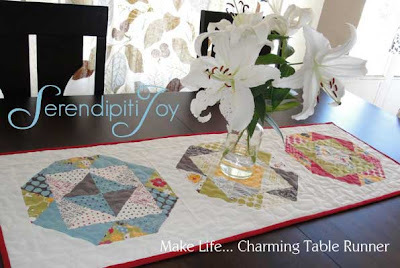 Table runners seem to be a popular quilting option in blog land, so I made one up using the three blocks made from one charm pack. If you don't have time or the inclination to make a whole quilt, why not try making a table runner instead? It's a great excuse to buy some flowers, too. Sew the 11.5" strips to the blocks: white strip, block, white strip, block, white strip, block, white strip, like in the picture above. Iron open the seams. Then sew the 42" strips. Iron open the seams. Your pieced should like the picture below. Then make your quilt sandwich (pieced top, batting, and backing fabric), baste and quilt. I wanted to pick up the red in the quilt, so I used a red fabric to bind the quilt. In less than 2 hours, you have a new table runner to grace your table or anything else that needs a little sprucing up. Oh, Fransson has some great tutorials on quilt making basics.